The Samsung Galaxy Tab ($399 with a two-year contract on T-Mobile as of November 11, 2010) is the first Android tablet that has what it takes to challenge Apple's dominant iPad. Available from five domestic wireless carriers--AT&T, Sprint, T-Mobile, U.S. Cellular, and Verizon--the Galaxy Tab's hardware is similar across providers. The big differences lie in service pricing, whether the carrier takes advantage of the Tab's mobile-hotspot capability, and whether the device has a SIM-card slot (CDMA-based Sprint and Verizon units lack this feature). Overall, you can expect the Tab models to be similar in use, with minor differences in which apps are installed from the get-go. As for pricing, T-Mobile has set its rates in a way that makes its Galaxy Tab stand out from the crowd in several noteworthy ways. For one thing, you can use the mobile-hotspot feature (also known as Wi-Fi sharing) at no additional charge under both monthly and prepaid mobile broadband plans; in contrast, Sprint charges $30 extra per month for the feature. Also, the device supports HSPA 7.2 and can benefit from T-Mobile's HSPA+ network in the markets that have the service. Judging from my extended use of the Tab, it's clear that Samsung has succeed in delivering the smoothest implementation of Android on a tablet to date--and it has done so on a smoothly designed piece of hardware that's a far cry from the generic slabs that have cropped up from Asia. 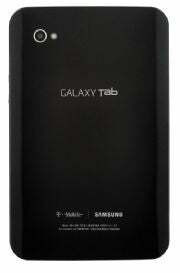 What's also clear is that, while the Galaxy Tab is a fine 1.0 product, the tablet has room to grow. With gentle curves and smooth finishes, the Galaxy Tab exudes a basic elegance. It takes design cues from the Galaxy S phones, and it's certainly more stylish and less clunky than the aforementioned off-brand Android tablets we've seen pop up across the Web. The back panel of the T-Mobile Galaxy Tab is shiny black plastic; it's there where you'll find the only outward T-Mobile branding on the device. The sides are matte black, while the front panel is glossy black, with a row of four touch-sensitive buttons along the bottom of the screen, just as on the Galaxy S smartphones. The first thing that jumps out about the Galaxy Tab is its manageable size. The Tab measures 7.5 by 4.7 inches and stands at a half-inch thick. That depth is the same as Apple's iPad; admittedly, though, in this comparison the latter benefits from rounding conventions, as the iPad measures 13.4mm to the Tab's 13mm. The dimensions and weight allow you to hold the Tab and type on it with your thumbs at the same time, using two hands or even one hand. Users with smaller hands will have to stretch to type one-handed; for larger hands, the arrangement is no problem. I found the keyboard very usable and responsive--a far cry better than many Android on-screen keyboards I've tried, and definitely more manageable for holding in two hands and efficiently thumb-typing. Two things held back my speed and accuracy, though. First, the keyboard lacks stock Android 2.x's pop-up letters, as found on iOS; their absence hindered accuracy. Second, I found that the screen's sensitivity made it easy to activate keyboard buttons accidentally (something that also proved to be a big issue with the capacitive touch menu buttons when I held the device in landscape orientation). Not surprisingly, the front face is all screen. With a 7-inch display and a weight of 0.8 pound, the Galaxy Tab is small enough to fit into some tight spaces (such as a roomy pocket), light enough to hold with one hand, and large enough to provide satisfying viewing. I found the Tab particularly comfy to hold in one hand, unlike the Apple iPad, which at 1.5 pounds is just too heavy to grasp with a single hand for any length of time. That said, as time wore on and I read a tome on the Amazon Kindle app, I realized that in an era of half-pound e-readers, I couldn't see myself holding the Tab for lengthy reading sessions of 30 minutes or more. The wide, Super VGA, 1024-by-600-pixel TFT display appeared bright, with pop-out, borderline oversaturated colors at the default settings. It had a pleasing angle of view; I could tilt and share the screen without altering the display. In use, however, I found that it didn't handle the glare of sunlight particularly well. (It also clearly shows fingerprints--lots of fingerprints.) The screen was slightly more viewable in daylight than the higher-resolution iPad, but it's for use in a pinch only. To say it's better than the iPad outdoors is a stretch--I could make out the time, but not how to adjust the time. In the end, I'd recommend neither product if your routine will take you outside, or into rooms that always have serious glare. The Galaxy Tab has two cameras--a rear-facing 3.2-megapixel camera and a front-facing 1.3-megapixel camera--and a camcorder for video chat. The back-facing camera provides passable quality, but none of the pictures I took with it particularly impressed me, either indoors with the flash or outdoors in natural light. I found the device surprisingly easy to use as a camera, though: The big viewfinder (otherwise known as the screen) was a kick, but no way are you going to be subtle when taking a photo with the Galaxy Tab. Physically, the device has very little else on it aside from volume-up and -down controls and a power button. It has 2GB of memory, and one MicroSD slot for expanding up to 32GB. To use the camera, you must have a card in place. The 4000-mAh battery provides 7 hours of video playback, according to Samsung. In my tests I found that the battery could last me through a weekend of casual use--which I'll define as video watching and Web surfing over Wi-Fi and 3G, taking a few snaps, and reading a book--for a few hours a day, and still have juice left over. You can expect to see software become the differentiator on tablets--and the Galaxy Tab is a good example. The various carriers are offering different software builds on this device. All Galaxy Tab models have Samsung's TouchWiz 3.0 Android overlay. I like how TouchWiz adds pop to Android's otherwise-indistinct icons, making the screen feel more like Apple's iOS than stock Android. From there, the customizations will vary among the carriers. The T-Mobile version has five home screens preconfigured (you can add or subtract from there in the settings). It has a slew of preinstalled apps, too, including Amazon Kindle for Android, Slacker Radio, a task manager, and a demo version of Gameloft's Asphalt 5 HD (available only via the T-Mobile Galaxy Tab). Like the Galaxy S phones, the Tab has Swype for potentially faster typing; Samsung's Social Hub for aggregating your messages across e-mail, text, and social networks; Facebook; Qik Video Chat (which you can use over T-Mobile's HSPA service); Think Office (for Word, Excel, PowerPoint, or PDF files); and Samsung Media Hub for accessing television shows and movies for download and rental. Samsung has optimized some core Android apps, redesigning the memo functions, e-mail, file-management system, calendar, contacts, music player, video player, and messaging apps (yes, text messaging works via the data plan; T-Mobile includes unlimited SMS/MMS with its monthly mobile broadband plans) to take full advantage of the extra screen real estate. E-mail, for example, presents a dual-pane view in landscape mode that shows both the open message and your various inboxes. Samsung has slightly tweaked the Android Desktop, too: A sliding tray of icons (browser, apps, e-mail, and the like) runs along the bottom of the display, while widgets occupy the middle expanse of the screen and an enhanced status bar runs along the top. Above that is the Android-standard notifications bar, which you can drag down with your finger as on any Android device. The ability to pinch to view all of your multiple home screens--a great shortcut feature not available on the phone series--is available here, too. 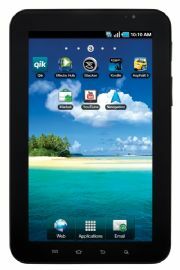 The Tab carries the Google-certified logo, and has the Android Market on board. Samsung says the 80,000-plus apps in the Android Market will work on the device, although only a small number of those are actually optimized for the Tab's roomy screen size and resolution. Of the apps I downloaded that weren't optimized for a large screen, all but one (a game) appeared centered in the screen at 800-by-400-pixel resolution. At launch, however, Media Hub is no iTunes. Not by a long shot--the selection is thin, and the navigation and presentation feel crude. In theory, with a greater selection of TV and movie options, better design, and integration with other Samsung connected devices, such as the company's HDTVs or Blu-ray players, I can see Media Hub becoming an asset to Samsung's Galaxy products. Today, it's just another app icon that will likely go untouched. My frustrations with the Galaxy Tab lie partly with what it lacks--a USB port, a non-proprietary connector, a better keyboard--and partly with Google's Android operating system itself, an OS that is not intended for use on tablets just yet. Frankly, Android does better than I expected on a 7-inch tablet, but the OS's nuances and quirks, such as its heavy reliance on the back button to get out of menus, feel more annoying on a larger screen. After extensive use, I believe that the Samsung Galaxy Tab lives up to its promise as the most credible Android tablet to date. Though it isn't perfect, it is a strong first-gen device. It isn't for everyone: The high cost without a monthly contract ($600) underscores that. Nevertheless, if you're planning to get a mobile broadband data device, the Galaxy Tab's potential as a mobile hotspot makes it more attractive than some of its competitors.